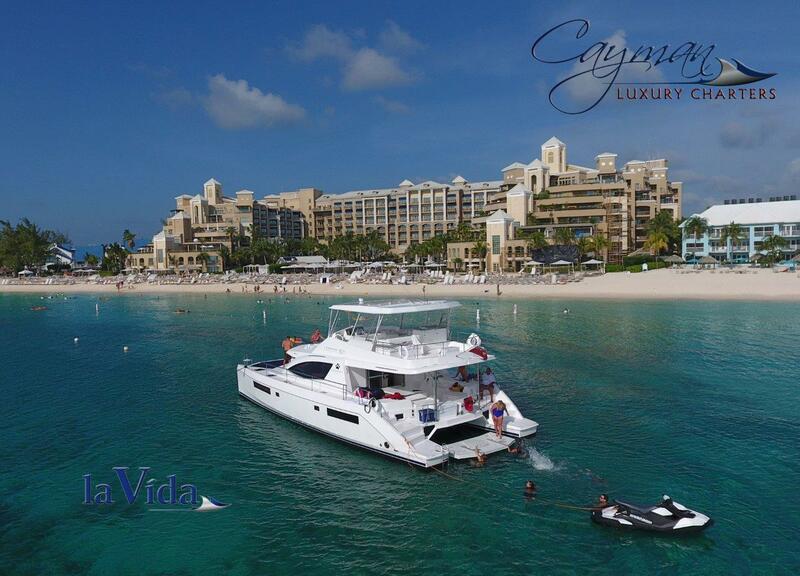 In Grand Cayman, you have the option to experience a private excursion on our brand new 51′ Leopard Power Catamaran La Vida or any one of our luxury sport yachts – the Cayman Elusion , the Sea Star or the Cayman Evasion, whether for half a day or all day. Our rates are very competitive and our service is top notch. Check out our video to virtually experience the fun things we do on our charter! We have nothing but fantastic comments from our guests on our Captain’s blog, and also on TripAdvisor, Twitter and Facebook ! Our video shows some of the fun activities we offer, which include visiting the Stingrays at the Sandbar, where you can stand in 3 feet of water and hold/touch/kiss/swim with the stingrays. Our staff is excellent with the stingrays. You can snorkel privately along the North Reef, which has an abundance of underwater life, and of course, you can have some fun at Starfish Point! You can also stop at one of our waterfront restaurants and have a fantastic lunch or dinner – it’s always so great to pull up to the restaurant’s dock by boat – there’s something special about that! We’ll customize your charter to your wishes! On our newest and largest luxury yacht, our 51′ Leopard Power Catamaran – La Vida, we can accommodate from 1 to 38 people and offer many inclusions, such as snorkeling gear, fishing gear, safety vests, light snacks and non-alcoholic beverages. We also include in our rate the wave-runner for rides and tubing! On our large yacht, the Cayman Elusion, we can accommodate from 1 to 15 people and offer many inclusions, such as snorkeling gear, fishing gear, safety vests, light snacks and non-alcoholic beverages. We also include in our rate the wave-runner for rides and tubing! On the Elusion’s slightly smaller sister yacht, the Sea Star, we can accommodate from 1 to 13 people and offer many inclusions, such as snorkeling gear, fishing gear, safety vests, light snacks and non-alcoholic beverages. We also include in our rate the wave-runner for rides and tubing! On our smaller yacht the Cayman Evasion, the luxury sport boat member of the Cayman Luxury Charters fleet, can accommodate from 1 to 7 people. We also offer many inclusions, such as snorkeling gear, fishing gear, safety vests and non-alcoholic beverages. For Seven Mile Beach area pickups, all yachts are docked at the fabulous Camana Bay for Seven Mile Beach area pickups which has so many fun things for you and your family/friends to experience. Call today at 1-345-949-6089 – 1-345-938-2525 or just fill out our reservation form to check price and availability. Need more information – email us at Info@CaymanLuxuryCharters.com. Cayman Luxury Charters will gladly arrange to have lunch catered on board from a top notch restaurant. We will stock the yacht to your specific food and beverage needs!